In the throes of an epic rock guitar solo, Pete the Cat (dynamic, compelling Zachary Hasbany) does not see the cat catcher until too late. Pete is whisked away from his band mates and placed with the Biddle family. Pete is less than thrilled to become a house cat, and the Biddles are puzzled by Pete’s unorthodox ways. He loves to “jam.” He’s a bed hog and easily forgets rules. He makes poor little Olive (age-defying, giggling Gabrielle Boyd) sneeze. And what kind of a cat wears shoes anyway? Less than one day into his stint as a house cat, Pete drops Jimmy (charmingly uptight Earl Alfred Paus) off at school, to the delight of his teacher. Instead of the scheduled math test, Pete suggests an art test. But Jimmy is so flustered by this last-minute change that he copies a classmate’s painting. The embarrassing gaffe launches a grand adventure to find some of the world’s most beautiful and best things to paint, so Jimmy can right his wrong. The vehicle of Pete’s choice is his band’s VW or the “very wonderful” bus. This is a bus that defies gravity and time and only starts its engine after you say something kind. 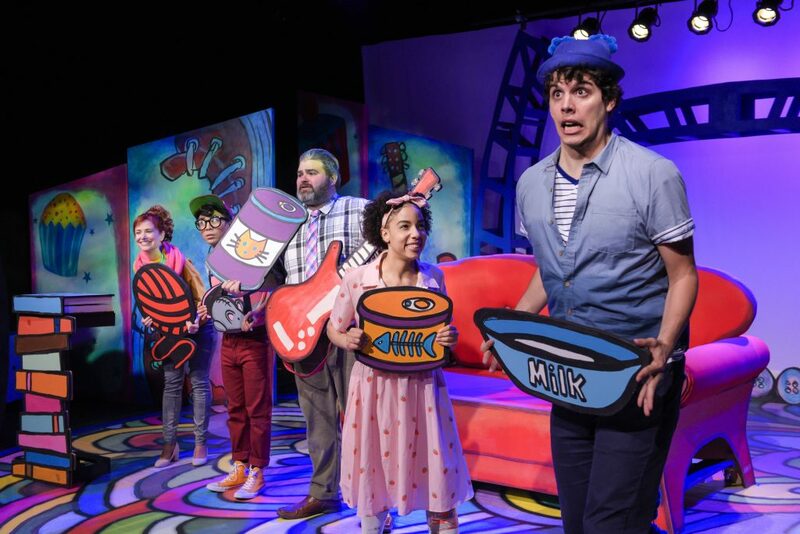 The focus on imagination throughout BACT’s “Pete the Cat” is mirrored in the set and the props. From Pete’s yellow skateboard to the phone, each prop is an oversized cardboard cutout painted in the dashed-off style of the artwork in the Pete the Cat books. The complete acceptance of these quirky set pieces by the actors lends the play a flexibility and out-of-the box sensibility. That sensibility and the general mood created by this strong team of actors engages the young audience members more than usual. 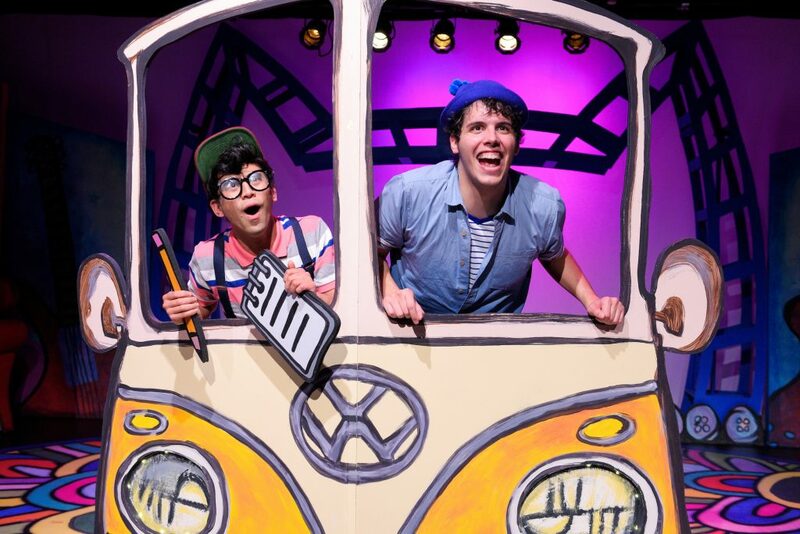 Unlike some other performances geared for children, where the distraction of more than a few kids is palpable, the entire theater is riveted to the action, the leaps in location, and the lively, funny, fantastically-arranged songs, just right in length. An added bonus: these actors can really sing, especially Pete. Hasbany steals the show with his presence, personality, and brilliant energy. When we took our seats, she turned to me and conspiratorially said, “They’re hiding.” I realized that she knew the actors were waiting backstage until the start of the show. After attending close to a dozen productions, she not only understands, but is starting to voice her understanding of what makes a play a play. 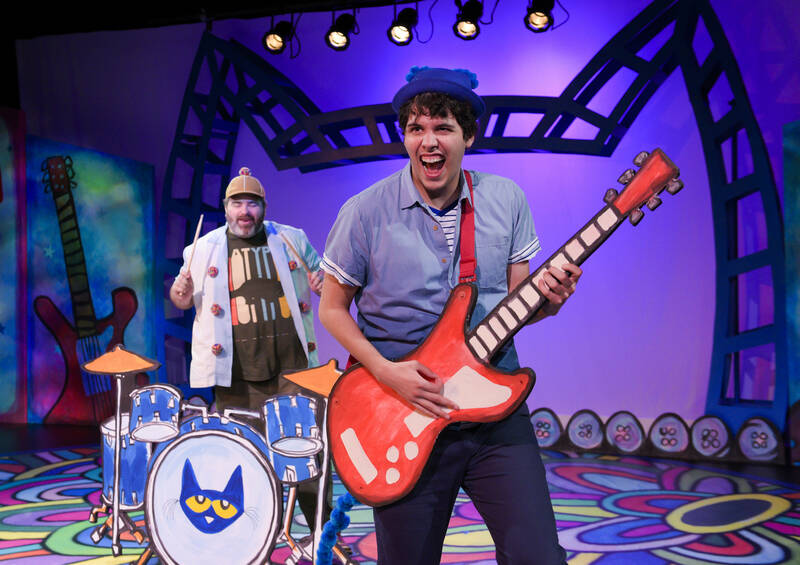 “Pete the Cat” is a must-see this summer. And I can’t wait to see what Itasca will take away from BACT’s next production. 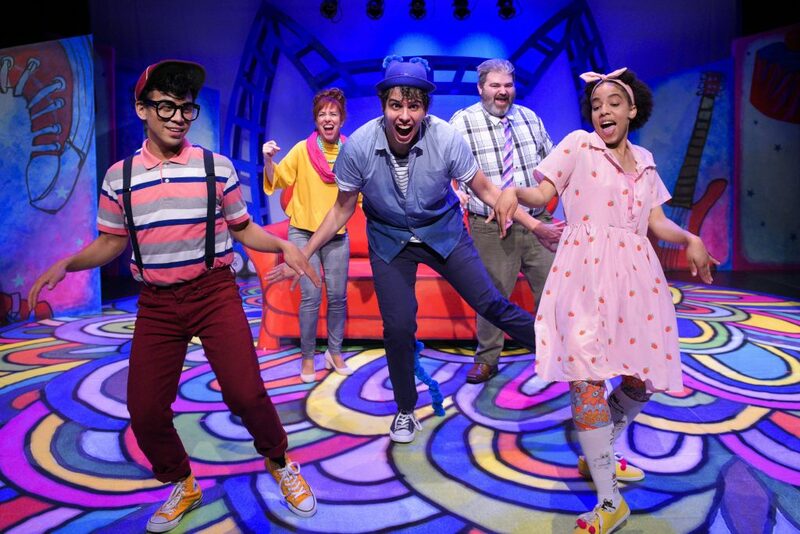 Cast: Zachary Hasbany, Earl Alfred Paus, Gabrielle Boyd, Sarah Sloan, and Matt Standley. After August 5: Sunnyvale Community Center Theatre, and Children’s Creativity Museum, San Francisco. “A Walk on the Moon” Rocks the Crowd, at ACT, S.F.